David Mackenzie is a fan of both The Prisoner and Portmeirion as well as being an ethusiast of the classic construction toy LEGO. 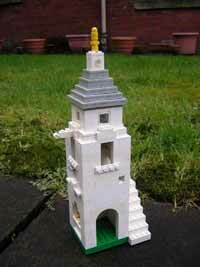 He has combined his interests to set about building a model of Portmeirion in Lego. This is a non-commercial project for his own enjoyment, but he has a website where you can see his efforts at ttp://www.priz.co.uk/build/ including pictures of the models alongside the real buildings! The results are surprisingly effective. So far the models include the Gloriette, Lady's Lodge, the Camera Obscura, the Campanile and the Roundhouse (the Prisoner Shop, which even includes an interior complete with customer checking out The Unmutual website on the shop computer!) as well as a Mini Moke and a Lotus 7.